Middlesex County gutter cleaning is a necessary part of maintaining your home. If your gutters become clogged, the water will overflow and form puddles at the base of the building. This could be extremely damaging to a home with a wood foundation. The water will cause the foundation to mold and rot, and it’s much more difficult to repair the foundation of your home than to clean out some gutters. After you get Markey LLC to clean out your gutters, refer to these tips to keeping your gutters cleaner longer. Gutters are often a feature of our home that we take for granted. We can often ignore their needs and allow them to slowly build up and clog. If you have any trees near your house, you should definitely keep an eye on your gutters for any signs of clogging. Directly after a large rainstorm is a good time to quickly check and see if your gutters need help. When they need to be cleaned, call a professional so you do not put yourself at risk, and you can get the best results. It saves you time and hassle. Try and schedule a cleaning at least twice a year, and plan to have one of those cleanings before the rainy seasons. Autumn and spring are popular times for gutter cleaning. Clean them out in spring to prepare for the rain storms, and also clear out debris so birds and other woodland creatures do not make your gutter their summer home. Also clean them in Autumn to take care of the leaves that are falling, and to keep them clear for the coming storms. 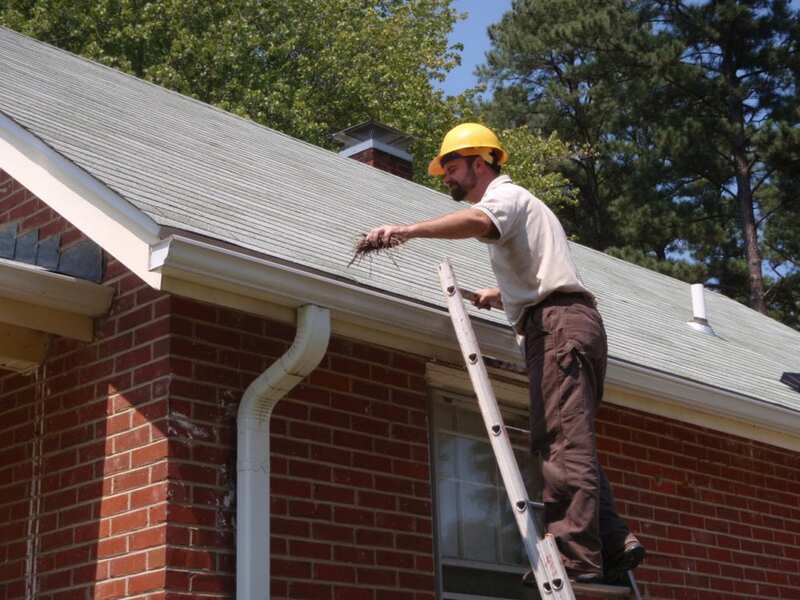 Markey LLC offers gutter protection options, and installing leaf guards can be an effective tool for preventing frequent gutter cleaning appointments. Make sure you consult with our professionals as to which materials will help best. Foam and brush types are not as effective because they can catch the leaves too much and form a layer on top of the leaf guards, rendering them ineffective. Consult the professionals to learn which leaf guards will best help your roof. Many of the homes we long for come with shady trees in our backyard. However, these trees near your roof are the main culprit of your gutter clogging. Take some time in the warmer seasons to trim and prune back your trees. This will make your roof happier, as well as your trees. If your trees have become too overgrown, hire a professional to maintain them. It may seem like a lot of expenses, but this will save you from many future problems. If your trees become too overgrown, branches can fall and damage your roof. That’s much more dangerous than rain gutter clogging. Cut back the trees to save your home from a lot of heartache. Our company has been providing gutter cleaning services for your home since 1981. We not only respect your home and the people that live in it, but we also have plenty of experience to give you the high functioning gutters you need. If your gutters overflow, your home is compromised to all kinds of water damage. Your roof, walls, and foundation can suffer the consequences of a few leaves and twigs stuck in your gutter. Your poor gutters often go unnoticed until something is wrong, but this can have catastrophic results. Let us serve you for all your Middlesex County gutter cleaning needs. To receive references and learn about all our services, visit our website or call 908-722-8958.